But don't let this fool you! 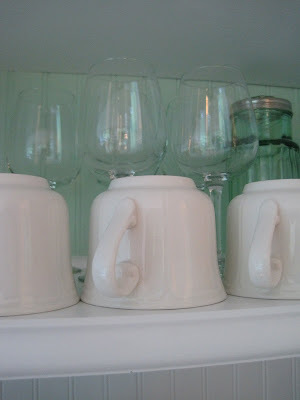 I am still plugging away at parts of the kitchen I thought would be finished weeks ago! I was planning on taking a break before starting on the island, but changed my mind on that. I could really use the extra working space in our kitchen! But... aren't these little pot holders so sweet? I found them at a sweet little fabric store, and couldn't resist! They aren't old, but they look like they could be! Now, promise you won't laugh, but they were my Mother's Day gift to myself this year! (Does anyone else do this?) I have been waiting to hang them up because, well~ another slightly embarrassing admission~ here I am, repainting the color of the bead board in the backs of the upper cabinets. The color clash was driving me crazy! If you know me, you know color is a very, very serious matter indeed. It cannot be just any green, you see. It has to be the right shade of green. So despite the magnetic repulsion I am developing toward paint brushes, I did the only thing to be done, and began painting them the same mellow green used on our floor. I went back and forth on this color, because what looks perfect on our floor sometimes looked a little too blue inside the cabinets. But then I remember that perhaps this is a choice that doesn't need to be taken quite so seriously! 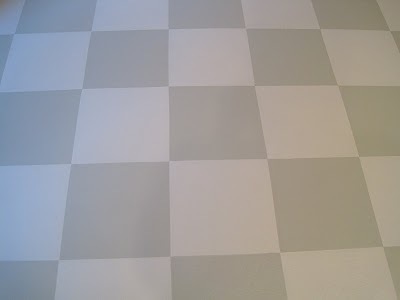 When we put down wood flooring, I can change the color simply enough if I want! It will only be on the back of three cabinets, and on our island. I also covered over that same first green the was on the half walls in the dining room and part of the kitchen. It is a really pretty white now, and I think it is going to fit just right. Those pot holders are adorable! I wish I knew how to crochet well. I'd be making some for myself! i thought for a moment the pot holders were some of the ones grandma made. = ) she sure crocheted some beautiful things. i think both the 50's shade of green and gray green look wonderful in the cupboards. could you take a picture with things inside the cupboard and show us how that looks so we can see before and after? have to admit the 50's shade of green is growing on me... you have a beautiful kitchen and i am not just saying that because i am your sister. Your pot holders are so cute! I can't wait to see the island. Glad that your kitchen is coming right along! The new cabinet color goes great with the red and green decorations! You've been working so hard, and it looks fantastic! I can't wait to come over and see it in person (hint hint). 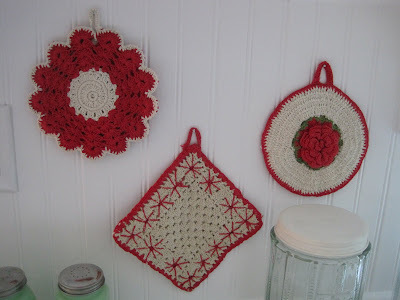 I bet there are a lot of us who couldn't resist vintage potholders--let alone red and white ones! 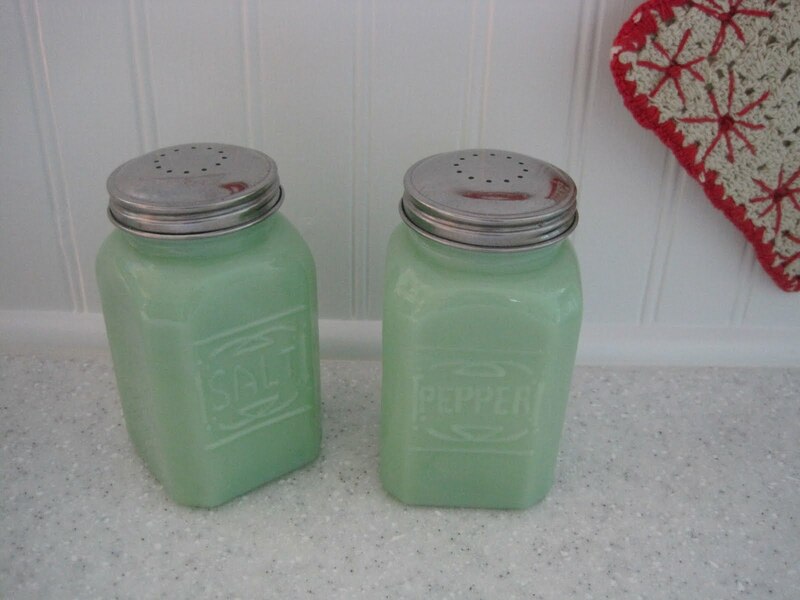 They're really cute, and I love the salt and pepper shakers, too! They go perfect in your kitchen-I can't wait to see your island. I don't know if I have ever told you this but you inspire me so much. I LOVE your floors! Wow. I'm going to have to poke around a bit to see if you blogged about the technique. Your pot holders are super cute, too. 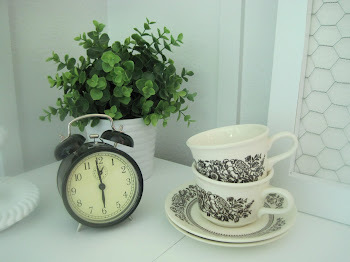 I just wanted to stop by & thank you for your sweet comments on my blog. So happy you liked the sheet music dresser & laundry tote. I'm off to check out you and your sis' new blog. New to your blog. Very nice! I have a potholder just like the one with the rose in the center. I love those kind of things myself. They are easy to make follow teaching lessons on youtube. You can play them over and over until you get it. I love youtube. Enjoyed my visit. Very adorable blog you have. Those are adorable. I think I saw the same ones or some that were very similar in a fabric store when I took my mom to Amish Country. Are they by Moda? 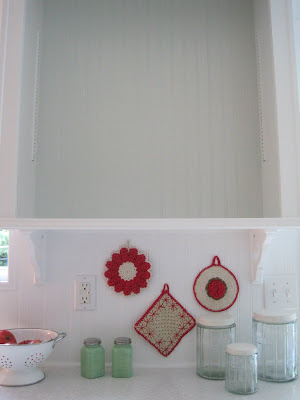 I love the pot holders and the shakers. Adorable! You find the prettiest unique things. Those pot holders and shakers are beautiful. I like those colors all mixed together like that. Enjoy that kitchen!! !